I brought home a pair of Checkered Giants last weekend. I love them a whole lot, they're so beautiful and they have the coolest personalities imaginable (even if the buck is a little bitey). I hate to admit it, but I wasn't FULLY prepared hutch wise. I have two large dogs, however, and so I have two large kennels from when they were pups and being trained, so I have them set up in these kennels and I keep telling myself this is short term while I get custom cages built. 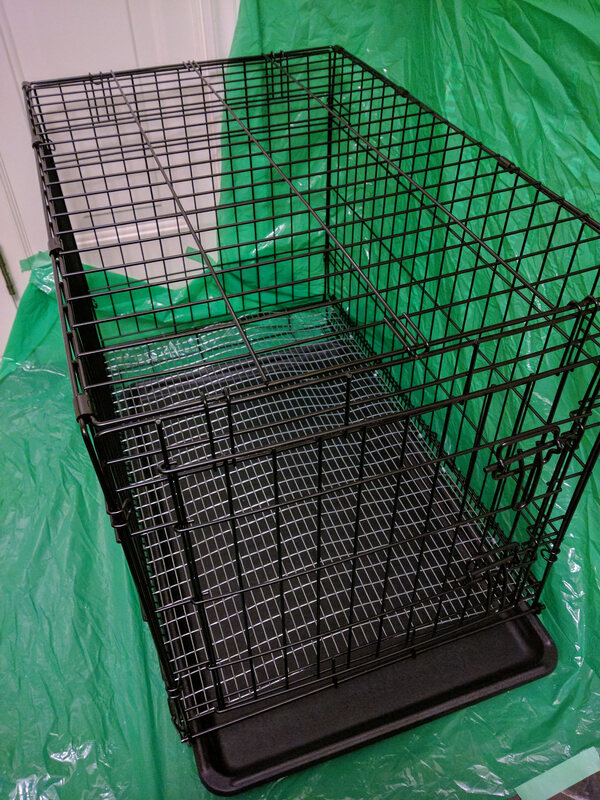 After doing some research and getting quotes on the custom cages I'm thinking it might be smarter to stick with the kennels because they are significantly more affordable and seem to be working fine. They're just as easy to clean, and come in such large sizes regularly that ordering new ones is really no issue (plus free two day shipping, yay prime). I will have to make a modification or two, honestly just adding hardware cloth to the outside to keep in kits, and legs so they're up off the ground (currently they're stationed on a couple of my show tables), but I'm not seeing why they won't work longterm. Am I overlooking something here? I'm just doubting myself and was hoping for some input. If you're keeping them indoors you want to protect your walls and floor from pee stains. I was surprised by how far up the up they can shoot even when their cage is on the floor. I've seen people use the wire dog crates as rabbit cages before. As long as the floor is kept clean and safety measures are added for the kits I don't see a problem with it. I have a folding dog crate I modified for rabbit use, called the Pop-up Bunny Barracks. I added 1/2" x 1 inch wire to the floor, above where the"tray" lives, and this makes a bit of a slide-out dropping pan set up. It is a messy cage, but is great for emergency housing. My Angora doe, Dust Devil, spent her quarantine there - she had some complaints about the flex in the floor wire based on her body language, but was otherwise fine in it. She is not into rabbit trampolines, apparently. So I am considering reinforcing the floor. I've used dog crates as extra cages for rabbits, but never for breeding does and kits. I found if I turned the cage on its side, the rabbits had more floor space and still enough head space. The door then would swing down and out of the way on the crates I had. I retrofitted with 1" by 1/2" cage wire, leaving a space under it. The floor wire we had was 14 gauge and we experienced no problems with sagging. If I remember correctly, we bound it in place with a continuous length of 20 gauge wire. (We were fortunate to get a huge spool of it at a yard sale.) So the floor was "sewn" in place, so to speak. This was in an outdoor rabbitry, so we did not use a tray . . . just let the bunny berries fall to the ground for periodic removal. Thanks everyone for all your input! I won't be using a wire floor for these guys just because of the nature of the breed. Eventually I'd like to get some modular cages from KW and do 1/2 wire, 1/2 solid or, alternatively, build some hutches the same way, but for now I think these will work. The doe was sold to me bred as a roundabout way of selling me a working trio with an unrelated buck, so she's due in about two weeks. I'll find out how kits do in the crate without modifications, which is okay timing seeing as they're still indoors for the time being. Unrelated, but... I'm kind of afraid to palpate her. I keep debating about whether or not I want to risk losing a hand. I've decided to build wood stands for them, once I get my shed, so I can still stack them. I'll post photos when I'm done! MeadowView wrote: Unrelated, but... I'm kind of afraid to palpate her. I keep debating about whether or not I want to risk losing a hand. As impatient as I am, I'd prefer to keep my fingers than know if a doe is pregnant (even if I could reliably palpate, which I can't)! At least rabbits have a relatively short gestation period at 30 days... and make sure to leave the next box in longer than you think you may need it (I recently had an experience with that).